This book is arranged in two parts: first about Cow Tom, born a slave and sold to a Creek Indian chief before he was 10 and then about his granddaughter, Rose who was born free. Tom gained his name while tending the tribe’s cows under the direction of his mentor, Old Turtle. Tom wanted more than living on someone else’s land, doing another’s bidding; he wanted marriage, a son, and most of all freedom. Both Old Turtle and Chief Yargee recognize Tom’s special skills with language and the Chief allows Tom to apply part of his earnings as a translator towards his and his family’s freedom. Rose dearly loved her grandfather and desperately wanted to find her place as a respected member of the family, the tribe, and break the family curse of only girl babies. These stories show family and tribal commitment from black slaves and freedmen at a time of conflict and removal of tribes from the southeast into Oklahoma Indian Territory. 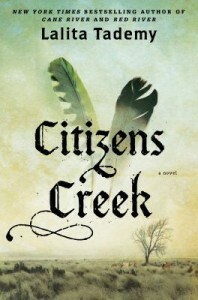 In Lalita Tademy’s Citizens Creek, the reader can easily become involved with the characters from their loyalty to one another and their conversations about their problems and struggle to reach their goals. A very rich man (Seth) kills himself by hanging and leaves much of his estate to his black caregiver by a holographic will. Of course, Seth’s family challenges the will; a jury must determine whether Seth’s handwritten will is valid. John Grisham’s masterful storytelling leads the reader through the trial, the families’ histories and a look at justice and redemption. This is one of Grisham’s best novels set in Clanton, Mississippi, with a street lawyer (Jake) from A Time to Kill as the principal character. 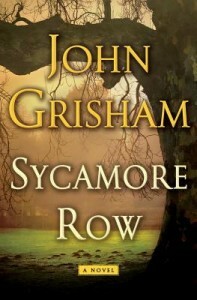 Grisham teases the reader to find out why a deceased man would abandon his children and grandchildren in such a manner; how he accumulated such a fortune; and what became of his brother who is mentioned in the handwritten will. Amazing characters, afflicted with greed, stupidity, racism and drink color the story in Sycamore Row and entertain the reader as he navigates through this engaging tale. For more information, read this review in the New York Times. Dana, a Black woman who lives in the 1970s, suddenly finds herself time-traveling to 1819 Maryland. She is called upon to save the life of young Rufus, son of a hideous slave-owner and her white ancestor. This is repeated twice more (once with her white husband Kevin) to save the life of Rufus. Time passes in years in Maryland but hours and days in 1976. Dana is engulfed in the life of slaves trying to provide care and comfort in a time of harshness and humiliation. Trying to make changes to slave treatment earns her a beating and she comes dangerously close to losing her life. Kevin working to help slaves escape finally returns after five years to Dana. She fights valiantly against possession by Rufus. Will she win? Will she return to 1976? Will she become a slave like her ancestors? Preview the book and visit Amazon.com for reviews. Interesting human introspection story about a changing neighborhood. It makes suburbanites think about other places. As western suburbs of Chicago tear down houses and neighborhoods change, it is everywhere and good to hear about other places and circumstances. It makes the reader think. Read a review from the Los Angeles Times or check out the official website for fun extras like reading guide questions, an excerpt, a Q&A with the author, or a video. A beautifully written story that proves several themes tied around relationships. A prominent man has raised his son and two adopted African-American sons since his wife’s death years ago. His relationship with his oldest son is lacking and his plans for his adopted sons are at odds with what they want for their lives. The tangle of feelings within the family, including the hole left in their lives when the mother died, are brought into focus when an accident brings new people into their world. In fact, their world is turned upside down. The characterizations are wonderful. I didn’t want the book to end.